Finally some impact coming our way?? I read an interesting post on Netweather that suggested there was not a split of the vortex due to a technical sww, but rather a severe wave 1 displacement event, this was the reason a piece of vortex ended up in the wrong place to bring about a beast from east. It will be interesting to see what the experts learn ftrom this one. Last edited by nacho libre; 08-02-2019 at 13:36. The amount of straw-clutching that has gone on with this event is amazing, so you're right, it's not a convincing argument and just looks like someone just trying to justify the many bust forecasts. If there was this wave-1 fly in the ointment, why wasn't it identified a few weeks ago? I've said all along, this one looked like being a SSW of little effect because there was never any indication of any major downward propagation, despite what many were trying to convince themselves of. But it's given many twitter accounts some added traffic, so in the end that's what it's all about, isn't it? Very strong Polar Vortex currently reaching record high mean zonal mean winds at 60N 10hPa. This is forecasted to not last long though with more normal mean zonal mean winds returning in about a week or so according to the GEFS. The final warming should be coming in 3-4 weeks or slightly more with the Polar Vortex going into hibernation for another Summer before we go on the rollercoaster again come Autumn. 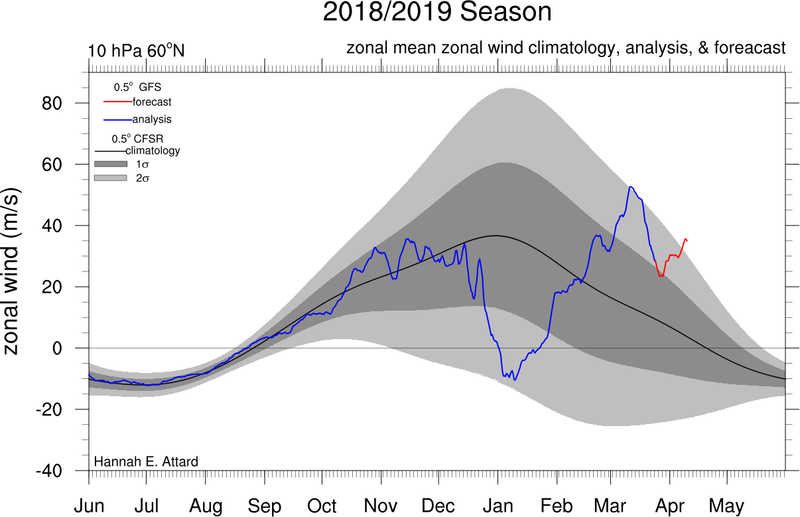 Latest forecast from the GFS shows the Polar Vortex remaining well organised into the second week of April with strong zonal mean zonal winds. New study showing more types of SSW events than the classic two types with split-split, displacement-split and displacement-displacement events based on their wave amplitude.